We specialize in manufacturing, exporting, and supplying Unshielded Twisted Pair Lan Cables. This Unshielded Twisted Pair Lan Cable is a high-speed high performance, 100 ohm impedance cable capable of carrying high bit-rate signaling for extended distances in horizontal cabling. Signal amplifiers are not required for a length of 328 feet (100 M). 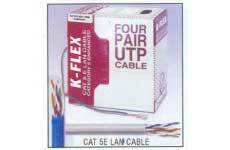 However, the clients can avail these Unshielded Twisted Pair Lan Cables at market leading prices.